Coffee and Gout: Is America's Favorite Beverage Off Limits? Can You Drink Coffee With Gout? Coffee and Gout: Is America’s Favorite Beverage Off Limits? I don’t suffer from gout, but my father does. He’s broken various bones in his body and had multiple surgeries — and yet he says the pain inflicted from his gout is one of the worst types of pains he has ever experienced. It is no secret that coffee is America’s most-loved beverage. In fact, one-third of Americans drinks coffee daily, half of Americans drink coffee at least weekly and two-thirds of Americans drink coffee at least occasionally. For the average daily coffee drinker, the typical person drinks 3.13 cups of coffee per day. What does this mean for the gout sufferer who loves coffee? Can they enjoy a cup of coffee now and then? It turns out there is conflicting evidence about coffee intake and the incidence of gout. In one Canadian/U.S. study, it was found that men who drank quite a bit of coffee had a lower risk of gout. The study was performed on 46,000 men over a 12-year period. Over the 12-year period, 757 men developed gout. 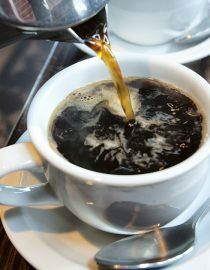 The study found that men who drank one to three cups of coffee had an eight percent decreased risk, while men who drank four cups had a 40 percent decreased risk. Men who drank six cups or more had a 60 percent decreased risk. While the researchers aren’t sure why coffee lowers gout risk, it may be that coffee is rich in phenol chlorgenic acid, an antioxidant. However, while coffee intake may lower the incidence of gout, it may worsen gout symptoms for those already suffering from gout. While drinking four cups of coffee may have shown to decrease gout risk, drinking four cups of coffee in 24 hours was associated with an 80 percent increased risk of recurrent flare-ups in those with gout. Allopurinol is a commonly used gout medication used to lower uric acid levels in the blood. It is an effective medication, but is known to actually cause a flare-up when the medication is initially started. Interestingly, allopurinol and caffeine have a very similar chemical structure, which may be why caffeine can both prevent and exacerbate gout symptoms. For the gout sufferer who drinks lots of coffee already, decreasing caffeine intake is probably not necessary unless it is known that caffeine is a trigger. However, those who doesn’t drink coffee on a regular basis should be aware that caffeine can trigger an attack. As you know, a diet rich in high-purine foods can exacerbate gout attacks. Identifying beverages that are low in purines can help to control symptoms. Adequate water intake is suggested. Proper hydration is linked to a decrease in exacerbations of gout. Experts recommend eight to 16 glasses of water daily. Diet soda instead of regular soda is recommended. The aforementioned Canadian/U.S. study showed that men who drank regular soda had an increased chance of developing gout. In fact, two or more regular sodas per day increased risk by 85 percent — a similar statistic to men who drank two to four alcoholic beverages each day. Men who drank diet soda didn’t show any increased risk for developing gout. There are many benefits of dairy. Dairy not only helps improve gout, but it has shown to help prevent gout flares from occurring in the first place.